Professor Emeritus Zeungnam Bien, the “father of Korean Robotics” has passed away on February 23, 2017. 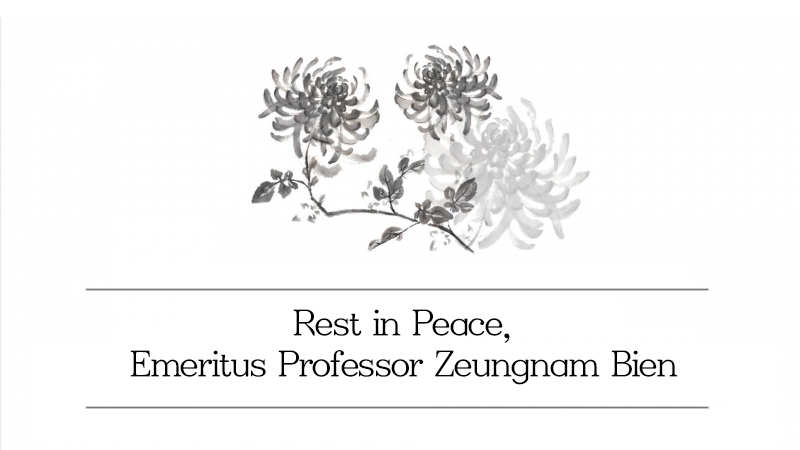 The late Professor Emeritus Zeungnam Bien served for a number of professional societies, domestic and overseas. A member of UNIST’s faculty since 2009, Bien was a pioneer in the fields of computer science and intelligent system. He was the founding president of the Korea Fuzzy Logic and Intelligent Systems Society during 1990-1995 and also, the general chairs for IFSA World Congress 1993, and for FUZZ-IEEE99, respectively. The late Professor Bien received his B.S. degree in Electronics Engineering from Seoul National University and M.S. and Ph.D. degrees in electrical engineering from the University of Iowa, USA. Prior to joining UNIST in 2009, he held several faculty positions at the University of Iowa and Korea Advanced Institute of Science & Technology (KAIST). He had published over 330 publications that are regarded as the highly cited papers and had obtained 22 patents registered. In recognition of his academic achievements and contribution to the development of computer engineering, he also received the Order of Science and Technology Merit from the South Korean government. He will be remembered as an inspiring researcher and pioneer in the field of robotics. Introduction of UNIST Student Acc..